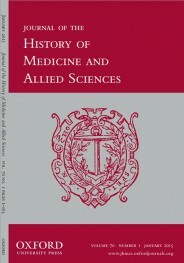 Started in 1946, the Journal of the History of Medicine and Allied Sciences is internationally recognized as one of the top publications in its field. The journal's coverage is broad, publishing the latest original research on the written beginnings of medicine in all its aspects. Teachers at medical schools have struggled with a basic problem for decades: they want their students not just to be competent doctors, but to be excellent ones. If you understand a little history, you can see why this is such a challenge. Medical schools in the United States and Canada established a standard four-year curriculum over a century ago. Since that time, the volume of medical information has grown exponentially. How should medical schools cram the ever-growing body of knowledge into the same curricular space? This challenge has led to a constant process of curricular reform as faculty cut what was once cutting-edge science to make room for new cutting-edge science. Anatomy has long been a rite of passage of medical school. Bacteriology once exemplified modern life science. But deans of medical education now wonder how much their students really need to learn about these sciences. Can these older fields be displaced to make space for new fields such as genomics, immunology, and neuroscience? Time in the curriculum is increasingly contested. Given this state of affairs, it might come as a bit of a surprise that faculty representing twenty medical schools met recently to make the case not for the new but for the old, specifically for the history of medicine. Even as medicine remains committed to pushing the frontier of knowledge, there is growing recognition that essential lessons for students and doctors derive from studying history. Why are historical perspectives invaluable to physicians in training? For starters, it is critical that physicians today understand that the burden of disease and our approach to therapeutics have both changed over time. This is obvious to anyone who has spoken to their grandparents about their childhood, or to anyone who has looked at bills of mortality, old pharmaceutical advertisements, or any other accounts of medicine. The challenge is to have a theory of disease that can account for the rise and fall of various diseases, and an understanding of efficacy that can explain why therapeutic practice changes over time. A condition like obesity may well have a strong genetic component, but genetics alone cannot explain the dramatic rise in obesity prevalence over the past generation. New treatments come and go, only partially in response to evidence of their efficacy. Instead, answers to questions about changing diseases and treatments require careful attention to changing social, economic, and political forces—that is to say, they require careful attention to historical context. 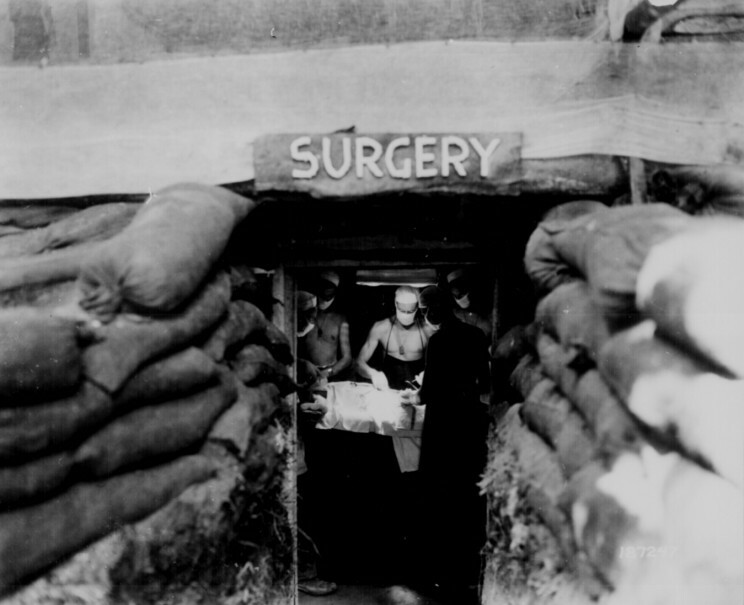 In an underground surgery room, behind the front lines on Bougainville, an American Army doctor operates on a US soldier wounded by a Japanese sniper. Public domain from Wikimedia Commons. Medical knowledge itself–firmly grounded in science as it may be — is nonetheless the result of specific cultural, economic, and political processes. What we discover in the future will depend on what research we fund now, what rules we set for the approval of new remedies, and what markets we envisage for future therapies. History provides perspective on the contingency of knowledge production and circulation, fostering clinicians’ ability to tolerate ambiguity and make decisions in the setting of incomplete knowledge. Ethical dilemmas in medical research and practice also change over time. Abortion has been criminalized and decriminalized, and is now at risk of being criminalized once again. Physician-assisted dying, once anathema, has lately become increasingly acceptable. History reveals the specific forces that shape ethical judgments and their consequences. History can teach many other lessons to students and doctors, lessons that offer invaluable insight into the nature and causes of disease, the meanings of therapeutic efficacy, the structure of medical institutions, and the moral dilemmas of clinical practice. We have not done, and likely cannot do, rigorous outcomes research to prove that better understanding of the history of medicine will produce better doctors. But such research has not been done for many topics in medical school curricula, such as anatomy or genomics, because the usefulness of these topics seems obvious. We argue that the usefulness of history in medical education should be just as obvious. Making the case for the essential role of history in medical education has the unfortunate effect of making the basic problem — of trying to cram ever more material into the curricula — even worse. Perhaps not every school has yet recruited faculty suited to teach the full range of potential lessons that history offers. But many schools do, and in others much can be done with thoughtful curriculum design. Just as medical school faculty work constantly to find room for new scientific discoveries, they can make space for the lessons of history, today. Heading image: Anatomy of the heart; And she had a heart! ; Autopsy. By Enrique Simonet (1866-1927). Public domain via Wikimedia Commons. David Jones trained as a psychiatrist and historian of medicine and is now the A. Bernard Ackerman Professor of the Culture of Medicine at Harvard University. Jeremy Greene holds the Elizabeth A. Treide and A. McGehee Harvey Chair in the History of Medicine at the Johns Hopkins University School of Medicine; he is also an internist at the East Baltimore Medical Center, affiliated with the Johns Hopkins Hospital. Jacalyn Duffin, hematologist and historian, is Professor in the Jason A. Hannah Chair of the History of Medicine, Queen’s University in Kingston, Canada. John Harley Warner is the Avalon Professor of the History of Medicine at Yale University, where he teaches undergraduate, graduate, and medical students. They are authors of the recent article, “Making the Case for History in Medical Education” in the Journal of the History of Medicine and Allied Sciences.